Call it what you will — a quirk of fate or a deliberate attempt at scoring brownie points. 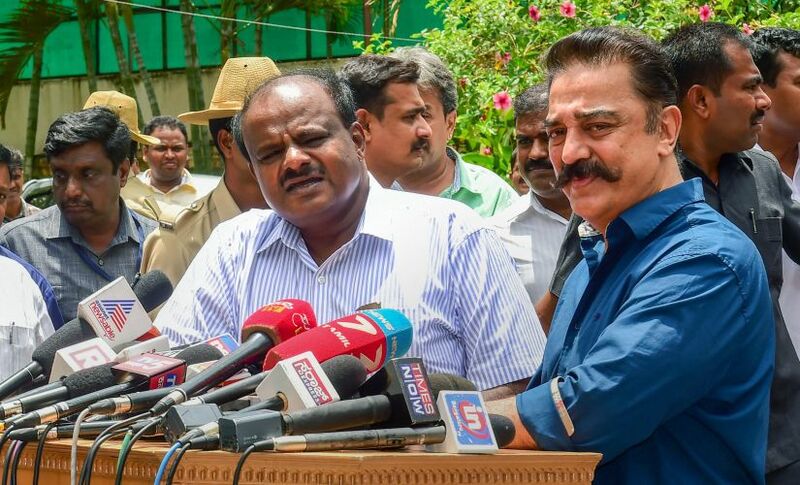 Kamal Haasan landed in Bengaluru on Monday along with representatives of farmer organisations from the Cauvery delta districts, to request Karnataka chief minister HD Kumaraswamy to release water downstream for the kuruvai crop. Ironically, this comes at a time when the Confederation of Pro-Kannada organisations has decided not to release 'Kaala' in the state. Why? Because they are annoyed that the Superstar said that whoever comes to power in Karnataka should implement the Supreme Court order on Cauvery. What this has done is to present the two thespians in sharp contrast, though a tad unfair to Rajinikanth. The narrative being presented is that while Haasan is lobbying for the release of Cauvery, Rajinikanth and his fans are focussed on Kaala's release. First things first. The position of the pro-Kannada outfits and that of the Karnataka Film Chamber of Commerce on Rajinikanth and Kaala is absurd, to say the least. Forget Rajini, any law-abiding person will say the same. The Supreme Court verdict is clear on how much water needs to be released by Karnataka to the three lower riparian states of Tamil Nadu, Kerala and Puducherry. It is thuggery to use Kaala as a soft target, just to show that Karnataka can cause financial losses to anyone in Tamil Nadu who speaks out of turn. The Kannada fringe groups point to Rajini's statement at the time of the IPL when he said it would be embarrassing to enjoy the cricket tournament in Chennai at a time when farmers are suffering because of the non-constitution of the Cauvery Management Board. 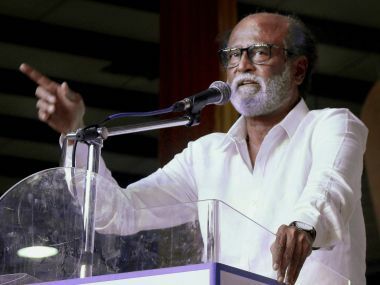 Rajinikanth had then suggested that the Chennai Super Kings (CSK) team and fans be allowed to wear black bands on their arm to register their protest. Subsequently, things took an ugly turn with fringe groups in Tamil Nadu forcing CSK to abandon their home venue in Chennai and move to Pune. If the pro-Tamil outfits forced CSK out by display of lumpen muscle power, those in Karnataka are looking to do the same with Kaala. The onus is on Kumaraswamy to throw the rule book at outfits that want to decide whether Rajini fans in Karnataka can watch Kaala or not. It is not about a movie, it is about whether India wants to be run by rule of law or by anyone who has a stone to throw. India saw bullies running amok over Padmaavat last year and the country should be in no mood to see an encore. There is hope because Kumaraswamy has also been a film producer and understands that movie business is not just about one actor. This won't be the first time that organisations in Karnataka are holding Tamil movies to ransom, over inter-state disputes. In 2008, after Rajini's comment on the Hogenakkal row, Kannada outfits refused to allow the release of Kuselan in Karnataka. Rajini had to apologise for hurting sentiments, clarifying his expression "kick them" was targetted at lumpen elements and not at Kannadigas. Last year, outfits in Karnataka took on Baahubali : The Conclusion objecting to comments made over the Cauvery dispute nine years ago by Tamil actor Sathyaraj, who played Kattappa in the film. The makers of the movie had to distance themselves from Sathyaraj and the actor had to apologise before Baahubali was allowed entry into Karnataka theatres. Having tasted blood twice, the Kannada outfits are emboldened to belittle Rajinikanth. But beyond Cauvery and Kaala, the visit is a pointer to the manner in which Kamal Haasan is positioning himself. He claims to speak on behalf of the people of Tamil Nadu, a 'Bigg Boss' of sorts outside the small screen. 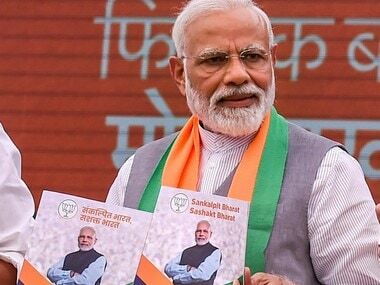 By dashing to Bengaluru, he has usurped the role of the Tamil Nadu chief minister, using the media attention to pole vault into a representative's role. Old-timers in Tamil Nadu would not have forgotten how the then chief minister MGR in the 1980s had rushed to Bengaluru to nudge his counterpart Ramakrishna Hegde to release Cauvery water. 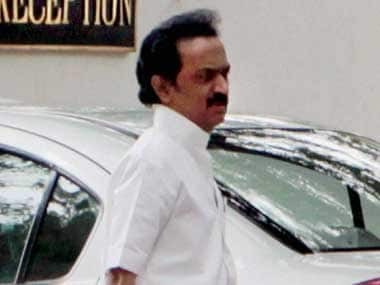 Such a move by anyone would have been unthinkable in a Tamil Nadu under J Jayalalithaa. 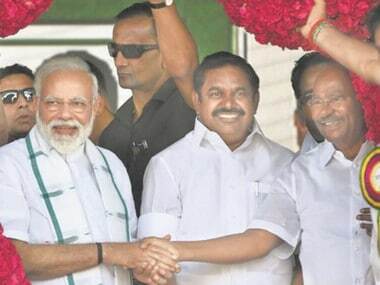 But Edappadi Palaniswami has become a chief minister-in-absentia, not marking his presence over Cauvery or even in Tuticorin where 13 people were killed in police firing during the protest against Sterlite plant. Last month, when Haasan called for an all-party meeting over Cauvery, most political parties gave it the miss. It was perhaps their way to show Haasan his place. There was also criticism over Haasan's decision to attend Kumaraswamy's swearing-in ceremony. Now, if Haasan is able to leverage his acquaintance with the Karnataka chief minister for Tamil Nadu's benefit, it will mean that for a newcomer into the world of politics, the versatile actor is learning the tricks of the trade pretty fast.